For many listeners, the wealth of Scriabin recordings on the market must be something of a mystery. It's not that the music is unworthy of this exposure, it clearly is, but more that its saleability is questionable to say the least. The answer, I think, lies in the relationships between record labels and their star pianists. Scriabin is first and foremost a pianist's composer, a creator of works that separate the men from the boys and, just as importantly, allow the performer to present unique and subjective interpretations without going against the spirit of the music. 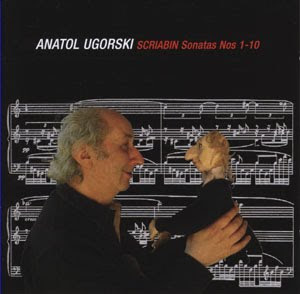 All of these features are very much in evidence with Anatol Ugorski's new recording of the sonatas. Ugorski had a short but stellar international career in the 1990s, framed by his moving from Russia to the West in 1992 and his subsequent decision to give up performing to concentrate on teaching. So what would it take to lure him back into the studio after an absence of around ten years? You guessed it. And how are the results? Well, they are certainly distinctive. The first thing that struck me about Ugorski's playing is the sheer dexterity of his technique. Late 50s isn't necessarily all that old for a pianist, but from the suppleness of the playing here, you'd think you were listening to a teenager. The interpretation is a different story, and Ugorski's grasp of this music is clearly the result of decades of close study. It would be difficult to defend this recording against accusations of over-indulgence. Many of the movements are far slower than you will hear elsewhere, and there are all sorts of pauses, gaps and elongations that can't in all fairness be described as Scriabin's own. But I don't hold any of this against Ugorski, I love the way that he lives for the moment and imbues every phrase with almost claustrophobic atmosphere. The recordings technology really helps this approach, with the piano placed in a warm acoustical environment. This is especially evident in the resonance of the piano upper register, those quiet held chords washing around inside the lid and refusing to disappear. The dynamic range of the recording, and of the performance itself I suspect, is greater than you'll hear on recordings by, for example, Ashkenazy or Ogden, which is a real boon for Scriabin's variegated and complex textures. The downside is a lack of linear focus. Scriabin's melodies, especially in the later works, are difficult to follow at the best of times, but here are often reduced to little more than frameworks for the harmonic and contrapuntal textures. Such are Ugorski's priorities, and the consistency of his approach invites the interpretation of this inverted musical heir achy as a legitimate performance decision. Whether or not you agree is another matter. The ordering of the sonatas is clever, with each disc beginning in the earlier, more digestible repertoire, and then gradually moving into the composer's more esoteric later works. That would be a sensible approach in any box set of the sonatas, but is particularly valuable here, given the expansive and, yes, indulgent nature of the readings. I would normally hesitate to recommend eccentric recordings of key works to those unfamiliar with them, but in this case I'm willing to make an exception. He is a real individual, Antol Ugorsi, and he has produced a leftfield recording of music that, even in more conservative hands, is itself eccentric. And perhaps that's the point: this is a strange interpretation to say the least, but with every wayward decision in the interpretation, Ugorski seems to be getting closer and closer to the spirit of the music. Add to that the precision of his technique, the sheer athleticism of his playing and the superior audio quality, and this becomes an attractive proposition indeed. If you are looking for best digital piano brands please come to our site, and take our service, we have top rated keyboards, and we are giving you long time warranty.